Crivelli and Company were managing both La Scala and La Fenice in Venice, and as a result, in April–May 1830 Bellini was able to negotiate a contract with them for two operas, one at each theatre. The opera for December 1831 at La Scala became Norma and while the one for the 1832 Carnival season at La Fenice became Beatrice di Tenda. With Bellini's La sonnambula successfully staged in March 1831 and Giuditta Pasta having demonstrated her extensive vocal and dramatic ranges in creating the role of Amina, the Swiss village maiden, she had been engaged by La Scala for her debut during the following season. Bellini and Romani then began to consider the subject of the coming autumn's opera. By the summer, they had decided to base it on Alexandre Soumet's play which was being performed in Paris at around that time and which Pasta would have seen. I hope that you will find this subject to your liking. Romani believes it to be very effective, and precisely because of the all-inclusive character for you, which is that of Norma. He will manipulate the situations so that they will not resemble other subjects at all, and he will retouch, even change, the characters to produce more effect, if need be. Norma was completed by about the end of November. While, for Romani, it became "the most beautiful rose in the garland" of all his work with Bellini, it was not achieved without some struggles. Bellini, now at the height of his powers, was very demanding of his librettist and required many re-writes before he was satisfied enough to set it to music. After rehearsals began on 5 December, Pasta balked at singing the Casta diva in act 1, now one of the most famous arias of the nineteenth century. She felt that it was "ill adapted to her vocal abilities", but Bellini was able to persuade her to keep trying for a week, after which she adapted to it and confessed her earlier error. At the opening night, the opera was received with what Weinstock describes as "chill indifference". To his friend Francesco Florimo, on the night of the premiere, Bellini wrote "Fiasco! Fiasco! Solemn fiasco!" and proceeded to tell him of the indifference of the audience and how it affected him. In addition, in a letter to his uncle on 28 December, Bellini tried to explain the reasons for the reactions. As other commentators have also noted, some problems were innate to the structure and content of the opera, while others were external to it. Bellini discusses the tiredness of the singers (after rehearsing the entire second act on the day of the premiere) as well as noting how certain numbers failed to please—and failed to please the composer as well! But then he explains that most of the second act was very effective. It appears from the letter that the second evening's performance was more successful and Weinstock reports it was from this performance forward that it "was recognised as a successful and important opera" with 208 performances given at La Scala alone by the end of the 19th century. Among the external reasons, Bellini cited the adverse reaction caused by "hostile factions in the audience" consisting of both the owner of a journal (and his claque) and also of "a very rich woman", who is identified by Weinstock as Contessa Giulia Samoyloff, the mistress of the composer Giovanni Pacini. On Bellini's part, there had long been a feeling of rivalry with Pacini ever since the failure of his own Zaira in Parma and his return to Milan in June 1829. With no firm contract for a new opera for Bellini, Pacini's success with his Il Talismano at La Scala—where it received 16 performances—fueled this rivalry, at least in Bellini's head. It was only when he staged a triumphant revival of his own with Il pirata with the original cast that he felt vindicated. Pirata received 24 consecutive performances between 16 July and 23 August 1829, thus outnumbering those for Pacini's opera. However, Bellini also noted that on the second performance evening of Norma, the theatre was full. In all, Norma was given 34 performances in its first season at La Scala, and reports from elsewhere, especially those from Bergamo, when it was staged in late 1832, suggested that it was becoming more and more popular. Between 1831 and 1850 Weinstock provides details of the dozens of performances given in numerous cities outside of Italy, and then he gives details of those beyond. Bellini left Milan for Naples, and then Sicily, on 5 January 1832 and, for the first time since 1827, 1832 became a year in which he did not write an opera. Norma quickly "[conquered] the whole of Europe in the space of a few years". Richard Wagner conducted Norma at Riga in 1837. Following the common nineteenth-century practice of adding interpolated arias, he wrote an aria for the bass and men's chorus for this production. However, that aria has not entered the general repertoire. Wagner wrote at the time that Norma was "indisputably Bellini's most successful composition". "In this opera, Bellini has undoubtedly risen to the greatest heights of his talent. In these days of romantic extravaganzas and the hyper-excitement of the so-called musical attractions he presents a phenomenon which can hardly be overrated. The action, free from all theatrical coups and dazzling effects, reminds one instinctively of a Greek tragedy. Perhaps the views expressed by Schiller in his 'Bride of Messina' to the effect that he had hopes for the full revival of the tragedy of the ancients upon our stage, in the form of the opera, will receive new justification in this Norma! Let anyone name me a spiritual painting of its kind, more fully carried out, than that of this wild Gaelic prophetess...Every emotional moment stands out plastically; nothing has been vaguely swept together..."
Here, where the poem rises to the tragic height of the ancient Greeks, this kind of form, which Bellini has certainly ennobled, serves only to increase the solemn and imposing character of the whole; all the phases of passion, which are rendered in so peculiarly clear a light by his art of song, are thereby made to rest upon a majestic soil and ground, above which they do not vaguely flutter about, but resolve themselves into a grand and manifest picture, which involuntarily calls to mind the creations of Gluck and Spontini. The opera was given its British premiere in London on 20 June 1833 and its US premiere at the St. Charles Theatre in New Orleans on 1 April 1836. In the late 1840s and during the Risorgimento era, some of the music was used in demonstrations of nationalistic fervour, one such example being the 1848 celebration of the liberation of Sicily from the rule of the Bourbons held in the cathedral in Palermo. There, the Guerra, guerra (“War, war!”) chorus from act 2 was sung. During the 20th century, with the bel canto revival, the most prolific Norma was the Greek-American soprano Maria Callas, who gave 89 stage performances (several of which exist on live recordings as well as two on studio versions made in 1954 and 1960). Callas's first appearances in the role began at the Teatro Comunale di Firenze in November/December 1948 followed by the second at the Teatro Colón, Buenos Aires in June 1949, both of which were conducted by Tullio Serafin. The following year, she appeared in the role at La Fenice in Venice in January 1950, this time under Antonino Votto, and in Mexico in May 1950 conducted by Guido Picco. In London in 1952, Callas sang Norma at the Royal Opera House, Covent Garden in November (where the role of Clotilde was sung by Joan Sutherland); she made her American debut singing the role at the Lyric Opera of Chicago in November 1954 under Nicola Rescigno; and then she appeared at the Metropolitan Opera in New York under Fausto Cleva in October/November 1956. In 1960, she performed Norma in the Ancient Theatre of Epidaurus in Greece with the collaboration of the Greek National Opera. Many other notable sopranos have performed the role, so that in modern times, Norma continues to be quite widely performed. Operabase shows 274 performances of 62 productions in 51 cities given or planned to be given since 1 January 2012. The title role—"one of the most taxing and wide-ranging parts in the entire repertory"—is one of the most difficult in the soprano repertoire. It calls for great vocal control of range, flexibility, and dynamics as well as containing a wide range of emotions: conflict of personal and public life, romantic life, maternal love, friendship, jealousy, murderous intent, and resignation. The German soprano Lilli Lehmann once remarked that the singing of all three Brünnhilde roles of Wagner's opera cycle Der Ring des Nibelungen in one evening would be less stressful than the singing of one Norma. She also commented "When you sing Wagner, you are so carried away by the dramatic emotion, the action, and the scene that you do not have to think how to sing the words. That comes of itself. But in Bellini, you must always have a care for beauty of tone and correct emission. "According to the Met Opera Archives Lehmann said this to Herald Tribune critic Henry Krehbiel. Throughout the 20th century, many singers have taken the role of Norma. In the early 1920s, it was Rosa Raisa, Claudia Muzio, and Rosa Ponselle who were each admired. Maria Callas emerged as a major force in the role in the post-World War II period. She made two studio recordings of the opera for EMI, and several broadcasts of her live performances have been preserved from the early 1950s through her final performances of the role in Paris in 1964. In the 1960s, two very different performers took the role: the Australian Dame Joan Sutherland and the Turkish Leyla Gencer. Following Sutherland's 1964 debut as Norma, Luciano Pavarotti called her "the greatest female voice of all time." The Dutch coloratura Cristina Deutekom tackled the role in 1970. Throughout the decade, four other bel canto specialists debuted their Normas: Radmila Bakočević, Montserrat Caballé, Beverly Sills, and Renata Scotto. Also singing Norma during this period were Grace Bumbry and Shirley Verrett, the American divas who began as mezzo-sopranos and eventually started singing soprano repertoire. During the 1980s and 1990s, the role of Norma was performed by such different singers as Katia Ricciarelli, Anna Tomowa-Sintow, Marisa Galvany, Dame Gwyneth Jones, and Jane Eaglen. Other Normas include Hasmik Papian, Fiorenza Cedolins, Galina Gorchakova, Maria Guleghina, Nelly Miricioiu, June Anderson, Edita Gruberová and Carmela Remigio (who performs more frequently the role of Adalgisa). In 2008, Daniela Dessì performed as Norma at Teatro Comunale di Bologna. In 2010 (in Dortmund) and 2013 (at the Salzburg Festival) the role was taken by mezzo-soprano Cecilia Bartoli: this version was also recorded with coloratura soprano Sumi Jo as Adalgisa. In 2011, Sondra Radvanovsky also added the role to her repertory, one to which she returned in the autumn 2014 at the San Francisco Opera and in the autumn of 2017 at the Metropolitan Opera in New York. On 13 April 2013, the Italian bel canto soprano, Mariella Devia, after a career of 40 years and one day after turning 65, successfully made her debut as Norma at the Teatro Comunale di Bologna. The action takes place in Gaul under the Roman occupation, and exposes the love affair between Pollione, Roman proconsul, Norma, his former companion, and the young Adalgisa. The background is the uprising of the Gallic people against the occupier, led by the druid Oroveso. Norma, high priestess of the Druidic temple who had two children of Pollione (breaking her chastity vows) Roman proconsul, discovers that her lover is in love with her friend a young priestess Adalgisa. Norma tries to convince him to give up Adalgisa and return to her, but he refuses. Norma then publicly confesses her fault and is sentenced to death. 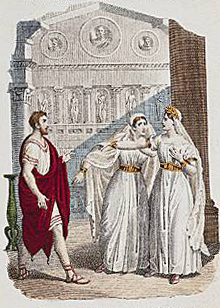 Pollione is convicted for pursuing Adalgisa in the temple and goes to the stake with Norma. As Norma leads the Druids and Priestesses, the crowd proclaims: Norma viene / "Norma is coming" and, as Oroveso awaits her, they describe her dress and manner. All kneel as she approaches. "The time is not ripe for our revenge," she declares, stating that Rome will perish one day by being worn down. Then, with the mistletoe in hand, she approaches the altar with a plea to the moon (the "Chaste Goddess"): (cavatina: Casta diva / "Chaste goddess ... turn upon us thy fair face, unclouded and unveiled"). Continuing, she pleads that the goddess shed upon earth that peace which she has created in heaven. She calls for all to complete the rites and then clear the uninitiated from the grove. To herself, she declares that she cannot hurt Pollione, but desires that things return to where they used to be: (Cabaletta: Ah! bello a me ritorna / "Return to me, O beautiful one, as in the bloom of our true love"). The assembled crowd accepts her cautious approach, and all leave the grove. In the concerted finale, Norma pleads with Oroveso to spare her children (Deh! non volerli vittime / "Please don't make them victims of my fatal error, don't cut down the flowers in their innocent age. Remember that they are your blood too, and have pity on them"). As she prepares to leap into the flames, the re-enamoured Pollione joins her, declaring "your pyre is mine as well. There, a holier and everlasting love will begin". Bellini is poor, it is true, in harmony and instrumentation; but rich in feeling and in an individual melancholy of his own! Even in the least well-known of his operas, in La straniera, in Il pirata, there are long, long, long melodies such as no-one before him had produced. And what truth and power of declamation, as for example in the duet between Pollione and Norma! [See act 2, scene 3 above. Norma: In mia man alfin tu sei / "At last you are in my hands"] And what elation of thought in the first phrase of the introduction [to the duet].....no-one ever has created another more beautiful and heavenly. ...Bellini's most astonishing achievement in Norma is, amid all the more obvious excitements of musical Romanticism, to have asserted his belief that the true magic of opera depended on a kind of incantation in which dramatic poetry and song are perfectly fused. Additionally, Kimbell provides examples of how the composer's art is revealed in this opera, but also noting that the ability to achieve a "fusion of music and dramatic meaning is to be found elsewhere in Bellini's work"
Schopenhauer claimed that tragedy causes the spectator to lose the will to live. "The horrors on the stage hold up to him the bitterness and worthlessness of life, and so the vanity of all its efforts and endeavors. The effect of this impression must be that he becomes aware, although only in an obscure feeling, that it is better to tear his heart away from life, to turn his willing away from it, not to love the world and life." He praised Norma for its artistic excellence in producing this effect. "…[T]he genuinely tragic effect of the catastrophe, the hero's resignation and spiritual exaltation produced by it, seldom appear so purely motivated and distinctly expressed as in the opera Norma, where it comes in the duet Qual cor tradisti, qual cor perdesti. [What a heart you betrayed, what a heart you lost.] Here the conversion of the will is clearly indicated by the quietness suddenly introduced into the music. Quite apart from its excellent music, and from the diction that can only be that of a libretto, and considered only according to its motives and to its interior economy, this piece is in general a tragedy of extreme perfection, a true model of the tragic disposition of the motives, of the tragic progress of the action, and of tragic development, together with the effect of these on the frame of mind of the heroes, which surmounts the world. This effect then passes on to the spectator…." Norma, or A Politician's Love (Danish:Norma eller En Politikers Kjærlighed) is an eight-page drama written as an opera parody by Henrik Ibsen. It is influenced by Bellini's Norma, which Ibsen saw in 1851, but the characters are contemporary politicians. The play was first printed anonymously in the satirical magazine Andhrimner in 1851. The first book edition came in 1909, and the first performance of the play was at a student theatre in Trondheim 1994. Writer Marion Zimmer Bradley acknowledged that the plot of her 1993 Historical Novel/Fantasy book "The Forest House" was based on that of "Norma" – relocated from Gaul to Britain, but sharing the basic plot outline of a love affair between a Druidic priestess and a Roman officer. Bradley further stated that, in homage to Bellini, the hymns in Chapter Five and Twenty-two of her book are adapted from libretto of the opera's Act I Scene i, and those in Chapter Thirty from Act II scene ii. ^ Friedlaender, Maryla (February 7, 1944). "What Wagner Thought of Norma". Opera News. p. 5. ^ Friedlaender, Maryla (March 22, 1954). "Norma Challenged Richard Wagner". Opera News. p. 32. ^ Performances of Norma since 1 January 2012 and going forward to 2016. However, in contrast, the same database reveals the following over the same time period in regard to performances of La traviata: "2282 performances of 431 productions, in 266 cities". ^ Interview between Edward Downes and Maria Callas. La Divina Complete, CD 4. EMI Classics. ^ Midgette, Anne (12 October 2010). "Soprano Joan Sutherland, legendary opera star and bel canto singer, dies at 83". The Washington Post. Retrieved 24 October 2010. ^ Dinko Fabris, "La Norma", La Repubblica (in Italian), Bari edition, 25 May 2011, p. 16; Alessandro Cammarano, "Venezia – Teatro La Fenice: Norma", OperaClick (in Italian), 20 May 2015. Remigio also sang the minor role of Clotilde in the Ravenna Festival's 1994 staging conducted by Riccardo Muti and recorded by EMI. ^ Alberto Mattioli, Per la superdiva Bartoli un debutto fuori Norma, La Stampa (in Italian), 1 July 2010. ^ Joseph Newsome, "Cecilia Bartoli as Norma", in Opera Today, 30 May 2013. ^ Hanssen, Jens-Morten (10 July 2005). "Facts about Norma". National Library of Norway. Retrieved 13 April 2015. ^ Marion Zimmer Bradley, preface to "The Forests of Avalon"
Rutherford, Susan (2007). "'La cantante delle passioni': Giuditta Pasta and the Idea of Operatic Performance", in Cambridge Opera Journal 19/2, pp. 107–138. This page is based on the Wikipedia article Norma (opera); it is used under the Creative Commons Attribution-ShareAlike 3.0 Unported License (CC-BY-SA). You may redistribute it, verbatim or modified, providing that you comply with the terms of the CC-BY-SA.